Let’s quit our jobs and open a food business together! 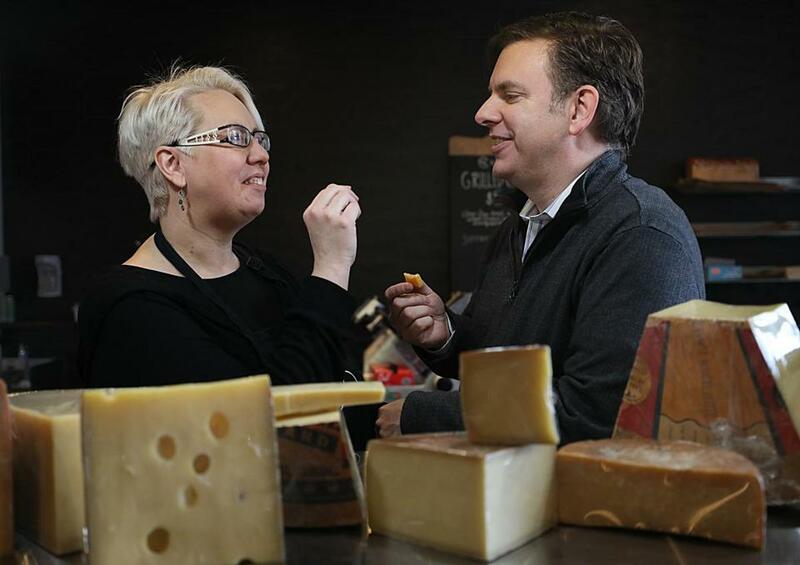 Jenn and Matt Mason are the couple behind Brookline cheese shop Curds & Co.
On Valentine’s Day, it’s nice to hear a love story. Here’s one you’ve surely heard before: Two sweethearts, as passionate about food as they are about each other, quit their jobs to open a restaurant (or an ice cream shop or a wine bar or . . . ). It’s so romantic! “When we first opened, we tried to make a rule that we wouldn’t talk about business when at least one of us was naked,” says Tse Wei Lim, who ran the now-closed restaurants Journeyman, Ames Street Deli, and Study with wife Diana Kudayarova. When we spoke with local couples involved in food businesses, what they had to say was remarkably consistent. And the lessons they learned in business apply to relationships too. Melissa Stefanini and Sebastian Galvez, the couple behind empanada-and-condiment company Buenas. 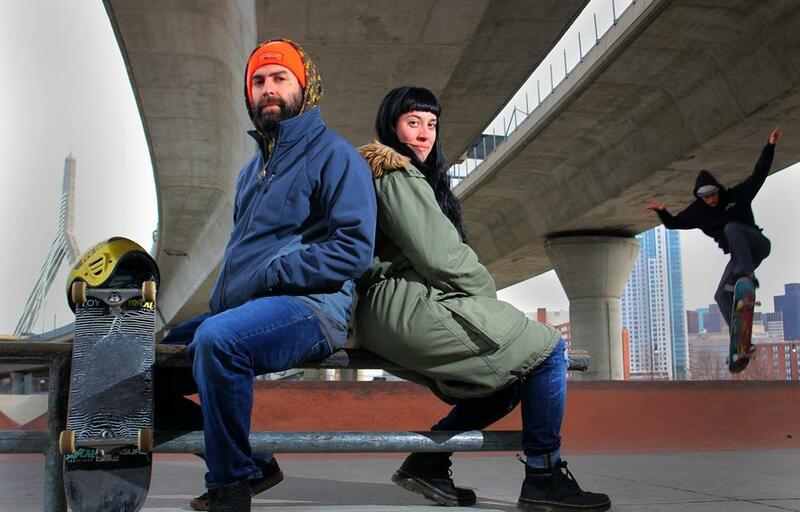 He used to run a skate shop, and they met at a party for the release of a new skateboard. The two, better known as Nini and Bass, respectively, started making empanadas, chimichurri, and the spicy Chilean sauce pebre when they lived in LA. Then Nini, who was a copywriter at an ad agency, got a job offer in Boston. “My boyfriend needs a job too,” she told the company. “If you let us sell our food in your agency, I’ll come.” Apparently someone in HR liked empanadas. That was four years ago. Since then, the business has expanded, with breweries and restaurants hosting pop-ups, and stores such as Formaggio, Central Bottle, and American Provisions selling its wares. “Our bigger picture is trying to build the whole product line to be the Goya of first-generation kids,” Nini says. Next up is a Buenas storefront, set to open in May as part of Somerville’s upcoming Bow Market. Jenn and Matt Mason had successful careers. She worked in startups; he is a software engineer. But the plan was always to do something together. Enter Curds & Co., the Brookline cheese shop they opened in August. He continues in his full-time job while taking on things like accounting for Curds & Co., while she devotes herself to the store. Their daughters, who are almost 17 and 18, sometimes work there, too. 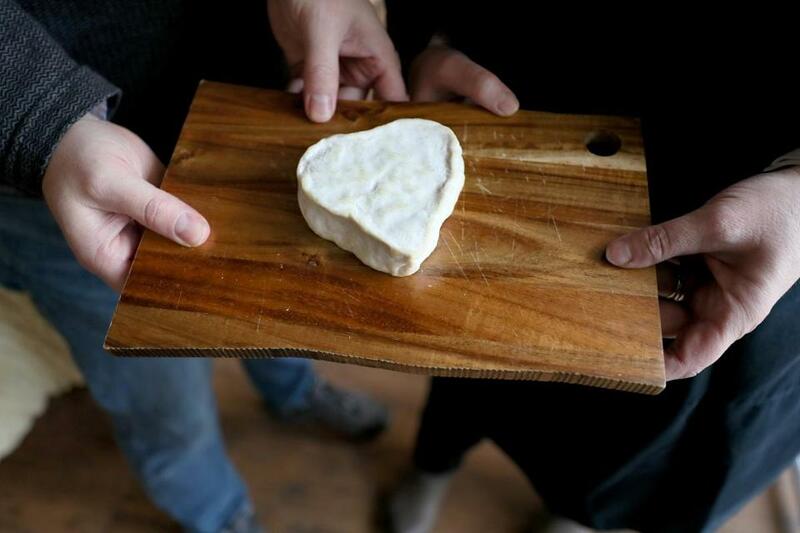 A heart-shaped triple cream from Champlain Valley, Vt., at Jenn and Matt Mason’s Curds & Co. When Jen Scott and Chris Hsi started having kids, it made them rethink their corporate lifestyle. “If I’m taking time away from my family, is it something I’m super-passionate about?” Scott wondered. They were, however, super-passionate about wine. Now they have three kids and two businesses: Taste Wine Bar & Cafe and wine store Common Vines, located across the street from each other downtown. “I’ve never experienced such extreme ups and downs, but at the same time it’s the most rewarding and fulfilling thing we’ve ever done except having kids,” Scott says. Hsi took a leave from the corporate world when the businesses were new, but now he plans to return for a while. You need “someone who’s stable and someone who’s building the dream,” Scott says. Deena Jalal and Hin Tang are also in the scoops business: They founded FoMu, the plant-based ice cream company. Before that, they both had corporate jobs; the children of entrepreneurs, they had seen how hard their parents worked, and they wanted a more traditional schedule for their family. “But it became really apparent when we wanted to start a family that the flexibility we thought we would have wasn’t there, and the passion wasn’t there. If you are going to give up time away from your kids, you want to be doing it for a good reason, for something you love and you think is adding value to yourself, your kids, your community,” Jalal says. They now have three sons, the youngest 6 weeks old. There are compromises involved when both members of a couple leave behind financially stable jobs. From time to time, Jalal and Tang have wondered whether one of them should return to a career that comes with health care. But every time they thought about it, they remembered all the hours they used to work for someone else, at something they didn’t feel passionate about. “We work 24 hours a day, but if we need to pick the kids up at 3, we’re able to make those decisions for ourselves and feel great about it,” Jalal says.